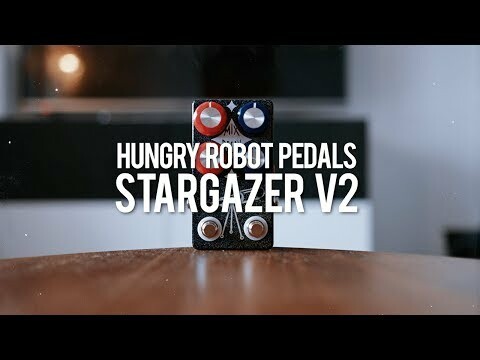 The Stargazer V2 is the follow up to one of Hungry Robot most loved pedals. The original Stargazer has found it place on the boards of hundreds of musicians around the world. The intent was to keep the overall essence of the orignal the same while expanding its functionality. The « Stargazer » sound that many have fallen in love with remains unchanged with its classic « hall » and « sparkle » modes​. The most obvious change is the physical size of the pedal; Hungry Robot was able to design the PCB more efficiently without major changes to the circuit. The « Sparkle » switch has been removed, but both reverb modes are still available. The left channel (red knobs) is the « HALL » channel and is a darker hall-style reverb. 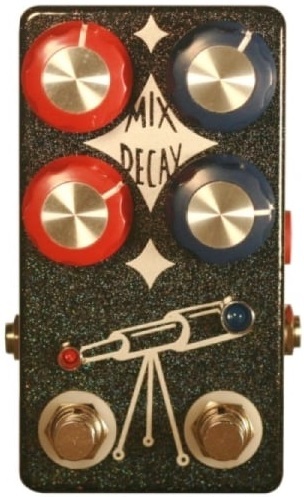 The right channel (blue knobs) is the « SPARKLE » channel and is a sparkly, bright reverb that has a shimmery quality without an octave shift.